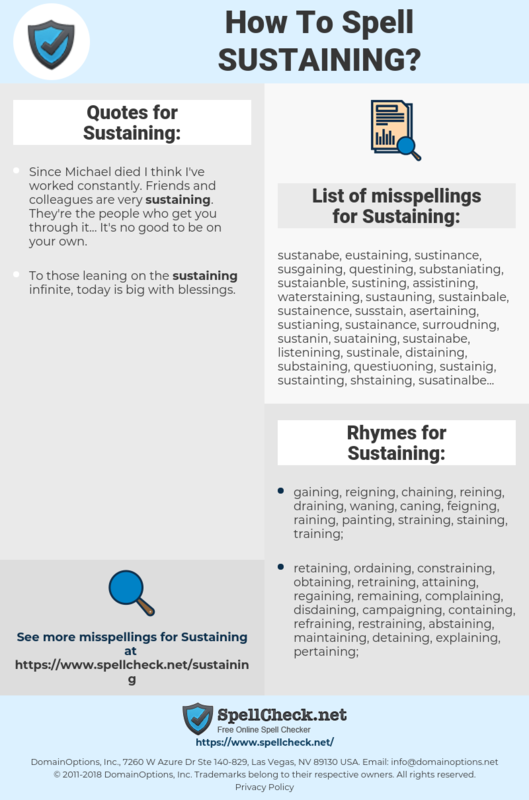 What are the misspellings for Sustaining? What are the common mistypes for Sustaining? 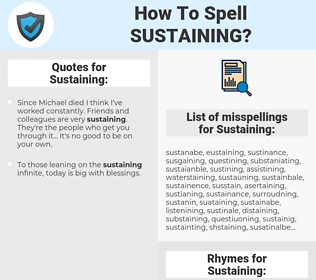 What are the quotes for Sustaining? What are the rhymes for Sustaining? What are the translations for Sustaining? What are the common typos for Sustaining? This graph shows how "Sustaining" have occurred between 1800 and 2008 in a corpus of English books. Community means engaging constructively with like -minded nations to build strong, sustaining institutions and alliances- and bringing emerging powers into this community so future conflict becomes less likely. Erhalt, tragend, nahrhaft, ertragend, erhaltend, erleidend, aushaltend, Kraft gebend, standhaltend.